Xiao Xu also sees magical realist author Gabriel Garcia Marquez as an influence, as well as the chronicler of rural idylls, Henry Thoreau. Other literary influences highlighted by the artist are Orhan Pamuk, Fyodor Dostoyevsky, Italo Calvino, Ryūnosuke Akutagawa and Jorge Luis Borges. In this painting, Pure Mountain Stream, the viewer is transported to a twilit world of contrasts, liquid and sold, bright and gloom. Navigating the way is as much about the mind as about what one can see. Xiao Xu graduated from Sichuan Fine Arts Institute with a Bachelor’s degree and Master’s degree in Chinese Painting department in 2007 and 2010. 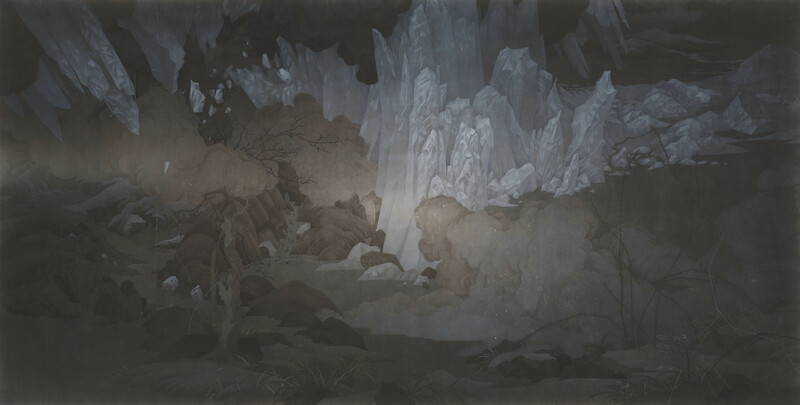 Xiao has participated in numerous exhibitions, including Devotion to Ink organized by Galerie Ora-Ora at Hong Kong Maritime Museum (2014), Enchanted Landscape – Ink Group Exhibition at Sotheby’s New York (2014), After 70’s: New Ink Painting – Yiqingzhai Collection Exhibition at Art Space, Sotheby’s Hong Kong (2013) and Danqinxi Gu Jin – HK-Taiwan Contemporary Ink Artists Series Exhibition at My Humble House Art Gallery, Taipei (2012).